Formerly the top-ranked women’s doubles player in the world since 2015, Indian ace Sania Mirza has dropped that ranking – after winning the title in her first WTA tournament of the year at the Brisbane International. Mirza and her partner, American Bethanie Mattek-Sands won the match in straight sets, 6-2, 6-3. 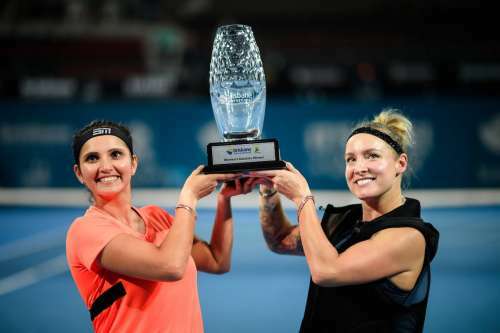 Top-seeded at the event, Mirza and Mattek-Sands beat the second seeded Russian pair of Ekaterina Makarova and Elena Vesnina, who have won two Grand Slam titles together. Mirza and Mattek-Sands have won titles together before, but split up after a short but successful partnership, following which Mirza paired with Martina Hingis. The Indo-Swiss combine won Grand Slams and WTA titles together, ending 2015 as the joint ranked World No. 1 in the women’s doubles. In August 2016, however, after what the pair considered less-than-ideal results, the two announced a shock split. Following the split, Mirza joined forces with Czech ace Barbora Strycova, while Hingis teamed up with American CoCo Vandeweghe. Mirza and Strycova did well on the tour, straightaway winning the title at the Western and Southern Open, and ended the WTA Tour on a high with an immensely successful Asian leg. The performances gave Mirza the sole World No.1 ranking. Sania Mirza was leading the WTA doubles rankings on points, with Vandeweghe only 330 points behind her. Since Mirza was the champion at Brisbane last year with Hingis, she does not gain or lose any points on her total ranking, as she was defending top points at the tournament. Mattek-Sands, who has improved on her 2016 performance at Brisbane, therefore gained points on her performance – putting her, ahead of Sania Mirza, at the World No. 1 spot. It is not known as of now if Mirza and Mattek-Sands will participate together on a regular basis; while the Indian has been successful with Strycova, Mattek-Sands has been successful with her own partner, Czech Lucie Safarova – the pair did in fact beat Mirza and Strycova to the Wuhan Open title late in 2016. Mirza has taken one-off doubles partners before; following her Western and Southern Open win with Strycova in 2016, she paired together with Romanian ace Monica Niculescu to win a title in Connecticut, following which Mirza again resumed her partnership with Strycova. There has been no comment on the permanence of the partnership from either party, but given each player’s success with their respective 2015 partners, a split might not be likely. This is an interesting shake-up in the women’s doubles scene. Should Mirza and Mattek-Sands become permanent partners, which they have in the past, this will pose both new challenges and perhaps overcome earlier problems going into the imminent Australian Open. But given Strycova and Mirza’s chemistry and more recent familiarity in practice, seeing them in action at the Australian Open would have been ideal. Tennis watchers will now be keen to see the status of the new partnership before any further speculation continues.